See what QuickBooks Enterprise Solutions can do for you! 6X more capacity over other QuickBooks products2 – Add up to one million names. Track hundreds of thousands of customers, vendors, and items. Flexibility that grows with your business – Easily set up 1 to 30 users.3 Manage your accounting, your payroll, payments, inventory, and more. 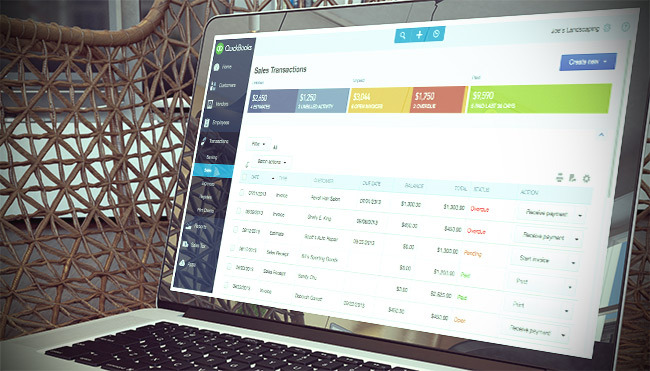 The QuickBooks look-and-feel you love – New to business management software? Don’t worry, QuickBooks Enterprise has the friendly, inviting QuickBooks look-and-feel that makes managing your business needs a snap. QuickBooks Enhanced Payroll gives you the power to manage payroll for your employees, create unlimited paychecks, and take advantage of free direct deposit5. No monthly employee fees6. Get paid faster and easier with QuickBooks Payments. QuickBooks Enterprise auto-updates invoices and sends payments right to your bank. With e-invoicing, you can conveniently email invoices with a Pay Now link to your customers. Our add-on Hosting Service9 lets you take your QuickBooks to the cloud and enjoy the freedom of managing your business anywhere you are. Work with your team across the desk… or across the continent. With Advanced Reporting10, your critical business data is right at your fingertips. Improved search functions make searching easier, auto-filled report templates save you time, and a help portal gives you answers whenever you need them. It’s never been easier to use our most powerful QuickBooks reporting tool. 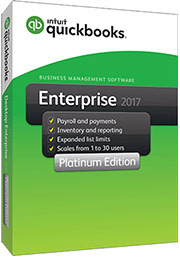 Our QuickBooks Enterprise Platinum subscription includes Advanced Inventory11 and Advanced Pricing12, two powerful tools built into the software. They’re designed for manufacturing, contractor, wholesale, retail, and other businesses handling large-scale inventory. Is your business in manufacturing, contracting, retail, or nonprofit? QuickBooks Enterprise offers a solution that’s tailor-made for the needs of your industry. 1. Based on Intuit survey of QuickBooks customers, conducted April 2015. 2. QuickBooks Enterprise allows you to add up to one million names (e.g. customers, vendors, employees) and up to one million items (e.g. inventory, non-inventory, and service items). Some performance degradation is likely as your lists approach these size thresholds. 3. Licenses are available in single-user increments from 1 to 10 users or 30 users. Fees apply. 4. QuickBooks Enhanced Payroll is included in the Gold and Platinum subscriptions. 5. Additional fees apply for direct deposit to 1099 vendors. 6. Active subscription, Internet access and Federal Employer Identification Number (FEIN) required. QuickBooks Enhanced Payroll requires a supported version of Windows Enterprise Solutions updated to the most current maintenance release. QuickBooks Enterprise supports over 100,000 employees, customers, vendors and other names combined. However, performance may slow when processing files containing more than 100 employees. Support is available Monday-Friday, 6AM to 6PM Pacific Time. Available to US customers with active subscriptions to QuickBooks Gold or Platinum Edition. Support is limited to setup and usage questions. Intuit reserves the right to limit to one hour to one question or issue. 24/7 access is subject to occasional downtime. Terms, conditions, availability, features, pricing, service and support are subject to change without notice. 7. Based on data for QuickBooks Enterprise 12.0. 8. Web requirements include Active X enabled Internet Explorer 8, 9, 10, and 11. Web access available on Windows XP Service Pack 3, Windows Vista, Windows 7, Windows 8, Windows 8.1. Remote desktop access available on Mac OS X version 10.4, 10.5, 10.6, 10.7, 10.8, 10.9, 10.10 and Windows XP Service Pack 3, Windows Vista, Windows 7, Windows 8, Windows 8.1. Mobile/Tablet access available on IOS enabled devices using Right Networks App and Android, Windows, and Blackberry mobile platforms via Microsoft Remote Desktop App. (Available in respective App Store). Internet connection required. Access is subject to Internet provider network availability and occasional downtime due to systems and server maintenance and events beyond our control. Subject to change without notice. 9. Additional fees apply for the QuickBooks Enterprise Hosting Service subscription. Hosting Service is available for QuickBooks Enterprise only and is valid for number of users equal to or less than the number of QuickBooks Enterprise users assigned to customer’s Intuit account. QuickBooks Enterprise sold separately; a valid QuickBooks Enterprise license code must be provided to Right Networks. Contact Right Networks to contract third party software. Support for Hosting Service provided by Right Networks. Terms, conditions, pricing, service and support options are subject to change without notice. 10. Advanced Reporting is available with all Enterprise subscriptions. 11. Advanced Inventory is included in the Platinum subscription. Requires QuickBooks Enterprise with an active QuickBooks Enterprise subscription and an Internet connection. You’ll automatically receive any new versions of our product that are released, when and if available, along with updates to your current version. 12. Advanced Pricing is included in the Platinum subscription. 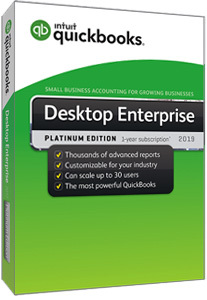 Requires QuickBooks Enterprise with an active QuickBooks Enterprise subscription and an Internet connection. You’ll automatically receive any new versions of our product that are released, when and if available, along with updates to your current version. 13. U.S.-based support for QuickBooks Enterprise is available weekdays from 4:00 am – 7:00 p.m. Pacific time. If support is needed outside these hours, the QuickBooks Core Support team is available 24/7. Support hours exclude occasional downtime due to system and server maintenance, company events, observed U.S. holidays and events beyond our control. Intuit reserves the right to limit each telephone contact to one hour and to one incident. 14. Active QuickBooks Enterprise subscription members receive new versions of our products when and if released within 12 months of QuickBooks Enterprise purchase date or subscription renewal date. Online access to training is included with each QuickBooks Enterprise subscription. 15. Online Backup Service requires Internet access and an active QuickBooks Enterprise subscription. Entire PC is limited to 100GB total storage, which includes all 45 days which you have stored. In some cases data damage may be too extensive and the data file may be non-recoverable. Terms, conditions, pricing, features, service and support options are subject to change at anytime without notice. Have a question? The VARC Solutions team of U.S.-based QuickBooks experts is ready with answers. Automatic product upgrades ensure you’ve got the latest version of QuickBooks Enterprise. Online data backup also protects your critical business data. Plus, a lot more. See how QuickBooks Enterprise can help you manage your business: take your free test drive. Over 85% say: Enterprise is more flexible than QuickBooks Pro & Premier. Here’s why 91% of customers say QuickBooks Enterprise makes managing their businesses easier. "I love your support team. Whenever I have an issue they are always available with the information needed to fix my issues. I also love the ease of setting up the chart of accounts and the ease of creating custom reports then save them for later use. I am happy that the team listens to our needs and adds new features which allow us to make tracking our business growth in a positive way. I love using QuickBooks and discovering and learning new things all the time. It is a great product for our small business."